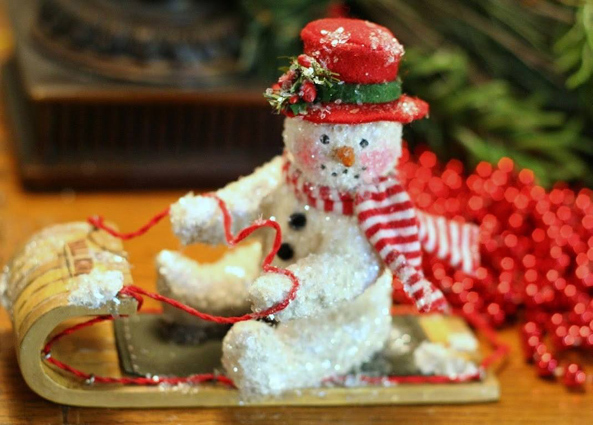 While many know Nancy Malay specifically as “The Christmas Lady”, she also creates a variety of one-of-a-kind vintage-inspired items for every Holiday, including vintage style Santa’s, snowmen, rabbits, chicks, as well as Americana and Halloween items. Nancy, who specializes in nostalgic and whimsical figures, meticulously handcrafts each item using paperclay, papier-mâché and cloth. Embellishments of mica, antique trimmings, German glass glitter, and tinsel add a unique sparkle to each creation reminiscent of earlier days. Some pieces are crafted in the Folk Art tradition, some from vintage or reproduction chocolate molds, while others look like they were handed down from the Victorian Era. Nancy’s work has been published 40 times in national publications such as Better Homes & Gardens Holiday Crafts, Prims, Create & Decorate, Celebrate 365, Country Women, Studios, and many more. Nancy was also chosen by the prestigious Early American Life magazine as one of the Country’s top artisans, and listed in the Directory of Traditional American Crafts in 2008, 2011, and 2012. 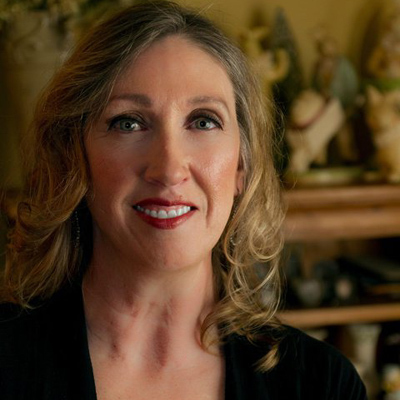 Besides selling her original art, she is also a licensed artist/designer for Midwest-CBK and has done contract work for Ashton-Drake and Sculpey. In this edition of The Creative Spotlight, I had the pleasure of interviewing Nancy Malay and asking her a few questions about her artistic influences, her prestigious career, her successful company, and of course her overall love and passion for creating ruly one-of-a-kind handcrafted works of art. TCS: Who or what inspired you to become an artist? And, at what age did you know that you wanted to do this for a living? Nancy Malay: Whether my sisters and I were mixing Papier-Mâché in the bathtub or cutting out Valentines, we made decorations for every Holiday when I was a child. We sewed most of our own clothing, and would make things that we liked and wanted to have, but weren’t able to purchase. My Mother was a very skilled seamstress and my Father was a cabinet maker, so I would say my inspiration came from both of them. I took a few art classes in college, but I received my BS, Double Major in Public Relations & Marketing. Creating was always something I just did “on the side”, while my husband and I ran a business. Over time, the demand for my originals grew, and I had a hard time keeping up with a full time job and working in my studio. But, I think the point at which I knew I would be doing this for a living is when I was asked to license my art. It seemed like this was “validation” that my work was good enough. I feel so fortunate that I’m able to get up and do what I love every day and get paid for it. The old saying – “Get a job that you love and you’ll never work a day in your life”, really applies to me! TCS: Can you describe your work in 3 words? TCS: Where is your workshop located and tell us what we would find in it? NM: My studio is located in our home in Faribault, Minnesota. It has large windows, with a lot of natural light and hardwood floors. I have plenty of space to work on my 6 foot long workbench and shelves hold all of my supplies. I usually have about 10-12 pieces on my table at all times. Bottles of paint, jars of glitter and buttons are all organized by color. Baskets of old lace and fabric are readily available on shelves. Because I don’t have to share this room with anyone, I have it arranged just how I like it. You’ll find Santas and snowmen, alongside witches and rabbits waiting to be completed, as I work on every Holiday all year long. My dog, Zoey, is a great companion in my studio …she seems to approve of all my work, and never complains about my choice of music! TCS: What does an average workday for Nancy Malay consist of? NM: I’m an early riser and a night owl, so you can find me in my studio almost any time of the day or night! I usually start my day around 5:00 am, and head to my studio with a cup of coffee in hand. I truly hate working in a mess, so the first thing I do is start fresh each day by cleaning up. Then, I put together the materials I’ll be using for my projects that day. (I love the vintage or time-worn look, with lots of sparkle and texture. It’s fun for me to go through my stash of antique trims, buttons and accessories and put together objects so that I can use a certain theme, or I’ll focus on specific colors, like pink or red.) Next, I turn on my music and get to work, usually spending at least 8 hours creating. TCS: Where do you usually get your craft-based ideas from? NM: I’m always thinking of new things I want to create, so I guess my ideas come from my imagination. 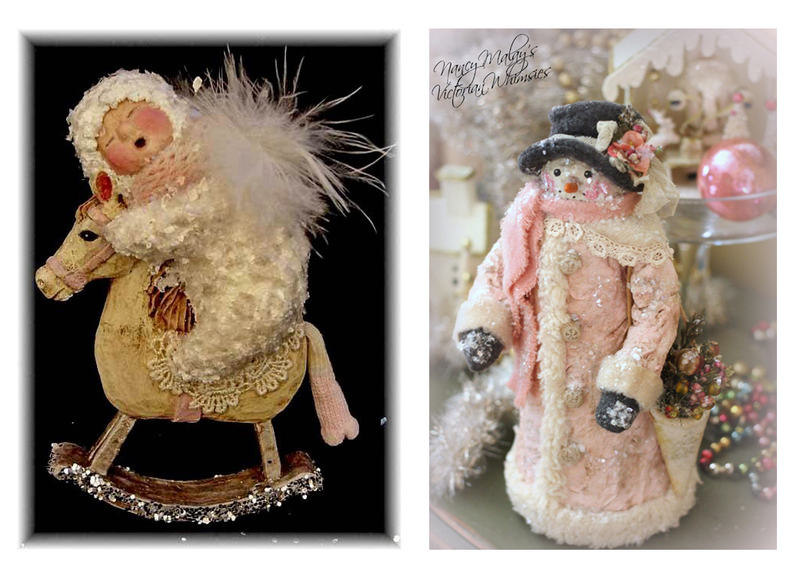 Childhood memories of toys or activities sometimes inspire snowmen or vintage style dolls. A trip to the antique store or flea market always gets my creative juices flowing. I love to recycle and reuse, and I really enjoy the challenge of using something in my work that might otherwise have been thrown away. Old lace and trims, antique buttons, or vintage jewelry are stored everywhere in my studio! While it’s important to keep up with new trends and colors, I just create what comes to mind. TCS: Over the course of your career, what are among some of your favorite crafts that you’ve designed? NM: It’s really hard to pick a favorite! There are some things that will hang around my studio a bit longer than others, because I’ve had a hard time parting with them – mostly because they took me so long to create! 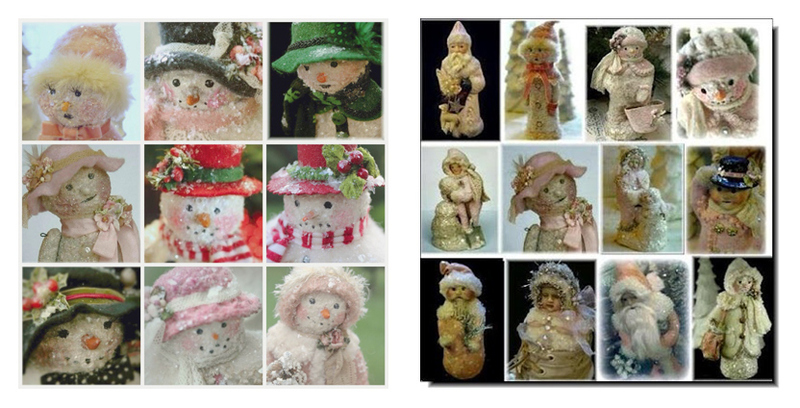 But, I do know of some pieces that have been the most popular with customers, one of them being a little “Snowgirl on a Rocking Horse” and the other a “Snowman in a Pink Coat”. TCS: Tell us about some of the magazine covers where your art work has been featured? 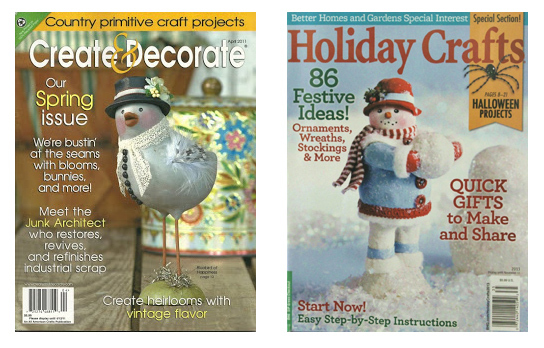 NM: My “Bluebird of Happiness” was on the cover of Create & Decorate magazine, and just recently, one of my snowmen was featured on the cover of a Better Homes & Gardens, “Holiday Crafts” magazine Some of my other work was on the back cover a couple of times in Celebrate 365. I’ve been fortunate to be published over 40 times in national publications. TCS: Tell us how excited you were when your “Bluebird of Happiness” was featured on the cover of Create & Decorate, Spring 2011? NM: This was the first time I had something featured on the front cover, so it was really fun. But, I have to say, the when my snowman was on Better Homes & Gardens, it was even more exciting! I had no idea ahead of time, and someone just let me know when they saw it at Barnes and Noble. NM: I’m so honored to be a member of two different groups: Primitive Folk Art Talk & Tea (PFATT) and Eclectic Halloween Artist Guild (EHAG). I think it’s great to connect with other artists who have similar interests, as well as doing things together, like charity auctions or Holiday events. TCS: Share with us how great it must be to have been chosen by the prestigious Early American Life magazine as one of the Country’s Top Artisans? NM: The first year I was chosen was 2008, and then I was chosen again in 2011 and 2012. Knowing that the competition is tough and that the jury process in very meticulous really makes the excitement of being chosen that much more satisfying. Last year was the first year my work was graded as “Museum Quality”, which was really an honor. 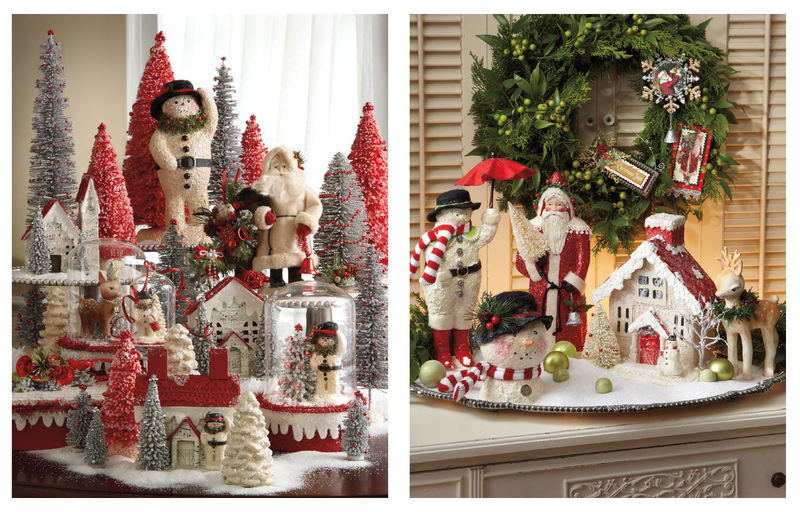 TCS: What is your favorite piece from your Midwest-CBK Christmas 2013 collection? And, what other pieces are available in stores nationwide? 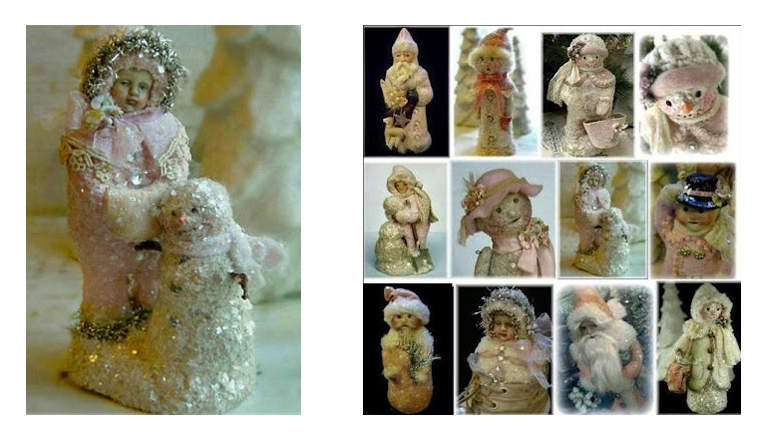 NM: I love the “Snowman Carrying a Little Snowgirl” that I made representing my husband carrying our little Granddaughter on his shoulders-mostly because of the sentimental aspect! A close 2nd and 3rd would be the “Christmas House” and “Reindeer”. There are about 45 different pieces of this collection available nationwide and in Canada. It’s always fun to go into a shop and see my items displayed. I also enjoy doing the artist signing events. TCS: Share with us your participation at the Ghoultide Gathering, a magical bazaar of Halloween art featuring celebrated artists from across the country, this past September? NM: I was so disappointed that I had to back out of the show at the last minute because of some health issues. But, I’ll be there next year…. and yes, it really is a magical show featuring some of the most talented artists around. I love creating Halloween items, especially witches and little houses. TCS: What do you enjoy most about what you do? And, what’s the biggest thing you struggle with? NM: I love the total freedom to create what I want, when I want. I like to keep things interesting and fresh, so each Season I try to branch out and try something new that I’ve never done before. It might be using a new product that I’ve heard about, or I’ll experiment with different objects. If I’m working on something and it’s not going as planned or I’m creatively “stuck”, I’ve learned to just set it aside and pick it up again another day. I can head outside and spend some time in the garden to break up my day. One of the things I struggle with most is pricing. It’s hard to put a value on some pieces, or to know what collectors are willing to pay. Also, being authentic and trying to set yourself apart from the other talented artists in the world can be a challenge. I just try to create what comes to mind, and my style just seems to emerge. 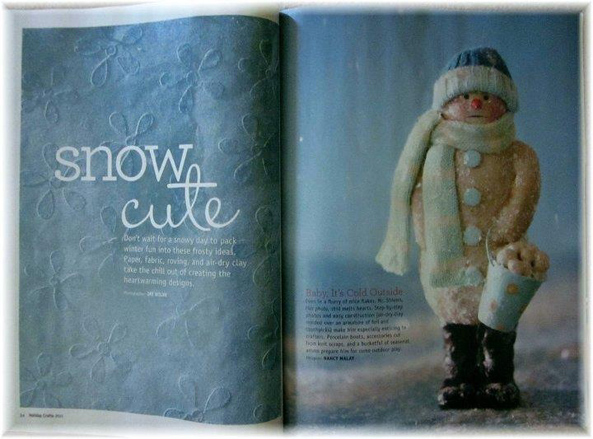 TCS: Share with us how you were selected to design a step-by-step snowman project for Better Homes and Gardens in the 2010, 2011, 2012, and 2013 Holiday Crafts magazine? NM: When I was asked to create a snowman back in 2010, I was thrilled! I’ve always loved this magazine, with so many wonderful projects to create, and the most beautiful photography! I enjoy writing the tutorials, and have done the step-by-step projects every year, which really shows how my snowmen are created from start to finish – visually as well as in the instructions. When my snowman was on the cover this year, I was so excited and honored! TCS: How do you market your business? NM: I believe that marketing is one of the most important things any business should do to be successful. Because I have a degree in Marketing, it’s something I’ve always enjoyed. With social media what it is today, it’s a lot easier than it used to be to keep your brand out in the public eye. I still send postcards, newsletters, and I have a blog that I try to keep updated. But at the end of the day, there is nothing like good old-fashioned word of mouth or customer referrals. If others are happy with their purchases, and they share this on their Facebook page, etc., it is different than you promoting yourself. There is no greater joy than having collectors that have bought from me for over 15 years still seek out new pieces! TCS: What is your website address and what can your customers and prospective see or do on your site? 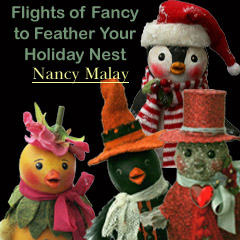 NM: I do have a website, which is www.nancymalay.com. On my website, you’ll find photos of my previous work, magazines I’m currently published in, a guestbook to sign, and links to take you to my blog or to read more information about me or my work. TCS: If someone were interested in purchasing some of your original work how can they contact you to get added onto your email notification list? NM: I always send out an email to those on my notification list when I have original items available for purchase. To be added to this list, please contact me at: nancymalay@gmail.com. TCS: Tell us all about Nancy Malay’s Web Sale? NM: While I typically sell my original items as I complete them, certain times of the year I have a Web Sale. This is usually around a certain Holiday, and I’ll sell about a dozen one-of-a-kind items. I notify my customers in advance and try to schedule it at a time that’s convenient for everyone – not too early for those on the West Coast and not too late for those in the East! TCS: Share with us some details about your online classes? NM: I’ve learned a lot over the years by trial and error, and I’ve come up with techniques that work well for me. When I teach classes, I share these tips and techniques with the students. I enjoy doing the video classes the most, because it’s almost like having the student sitting right beside me in my studio. I can show them hands-on techniques of working with paperclay, or explain why certain products work best for different projects. I’m a “visual” learner myself, so I think this is why I like teaching this way. For instance, there are so many different types of glue on the market – and it’s quite possible that I’ve tried 90% of them! But, there are some, like Fabri-Tac by Beacon, that I can’t do without! It’s an instant bond on things like fabric, leather, etc. I call it my hot glue gun in a bottle! TCS: Have you embraced Social Media to promote your business? NM: I think social media is such a great way to not only promote my business, but a wonderful way to engage and connect with customers on a personal level. I’m an avid gardener and also love photography, so I’m always posting photos of beautiful flowers from my garden, or photos after a hike through the Nature Center. I’ll also share photos of works in progress – it’s a little behind-the-scenes peek into my life! From Pinterest to Facebook, photography is a fantastic tool for sharing your art with the world. Additionally, I also have a YouTube channel and a Twitter account. TCS: Share with us your passion for Gardening? I’ve always loved gardening and playing in the dirt. As an artist, I think it’s just an extension of my love of color and design. 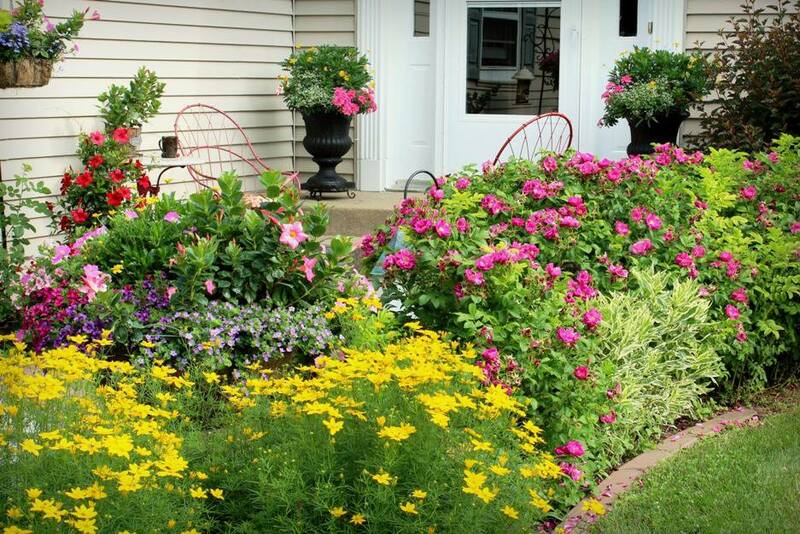 My gardens are a combination of perennials and annuals, with a mixture of texture and color. I look at it as an ever changing canvas or painting. Experimenting with new plants, and finding out what works in my soil and what doesn’t is challenging and thrilling at the same time. It can be so exciting to find a flower blooming that I never planted…maybe carried there by a bird. I like to change it up a bit every year and be creative when planting things and also add fun items like a trellis, old benches and wire roosters. The smell, the colors and the joy of watching plants sprout through the ground and bloom into glorious flowers just makes me happy! Sitting on my patio, enjoying a glass of ice tea when the garden is in full bloom is just a little slice of heaven on earth. TCS: From a design perspective, what are you currently working on (i.e., on Facebook you recently mentioned that you had some exciting news, can you please share it)? 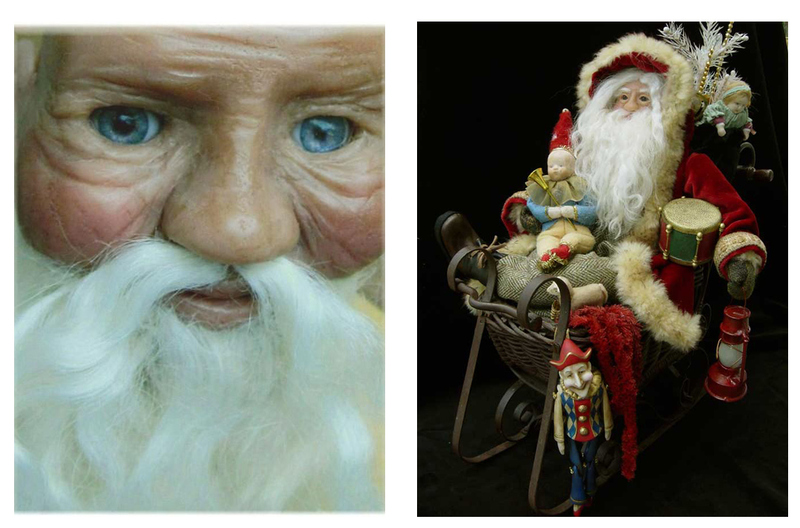 NM: Right now, I have several Santas on my workbench. They are one of my favorite things to create, even though they are the most time consuming. I love that they have so much detail and giving each one their facial expressions make them come to life. I find that adding the mohair beard and hair, (strand by strand) is really challenging, but relaxing to do. I’m also creating prototypes for a company I’m licensed with. And, that news you want me to share? Soon…..! TCS: What’s your favorite metaphor? And, how does it apply to your work as an artist? NM: “An Infinite Spectrum of Possibilities” is one of my favorite metaphors! I feel like all of the ideas rolling around in my head really are infinite…and the only thing getting in the way is time! TCS: What specific qualities do you think an artist within your industry must possess in order to be successful? NM: Artists have to be confident. Not everyone is going to like your work and you have to face the fact that you are going to have your share of rejections. It’s never easy to be turned down, but you really shouldn’t take it too personally…. you may even be rejected for reasons unrelated to your art. Use it as a tool for finding your niche or taking that step to try something new. And seriously, I do believe that when one door closes, that another one opens.